The Royal London One-Day Cup gets underway on Thursday with five fixtures, one of which comes from Edgbaston where 2016 winners Warwickshire welcome Derbyshire to Birmingham for the second time this season, having already defeated them in the Championship. Warwickshire have enjoyed a fabulous start to life in Division Two following last season’s relegation. Since their opening day draw against Sussex, three consecutive victories have taken them to the top of the table and they look a good bet for an immediate return to Division One. While for some clubs competing on more than one front simply is not possible due to squad limitations, there will be no such problem for the Bears. Adam Hose, Aaron Thomason and Ed Pollock, all of whom are dangerous white-ball operators, will likely come into a side that, despite a disappointing effort in this tournament last year with only two wins, must be considered one of the favourites to reach Lord’s. Derbyshire have had a mixed start to the season. A win over Middlesex, to the surprise of many, signalled that they would perhaps be dark horses of Division Two. Yet a defeat and two draws since have dampened spirits and success with the white ball is probably their best chance of silverware in 2018. However they will have to improve on their results from recent years in this competition having only won four times combined in 2016 and 2017. The replication of the form that took this side to the quarter-finals of the T20 Blast last year will be required, if the Falcons are to improve their efforts in this competition. 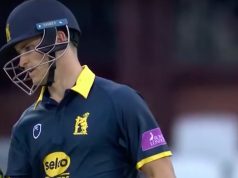 Having just singed a new contract, Ed Pollock will be looking to reproduce the scintillating form that saw him burst onto the scene during the Birmingham Bears run to the T20 Blast final last season. He only played nine matches, but his influence was substantial, scoring at a strike rate of 174 and striking fear into opposition bowlers. His 23-ball half-century in the semi-final against Glamorgan was one of the highlights of finals day itself. This season he’ll be looking to also make an impact in the One-Day Cup, and gets his first opportunity to do so against Derbyshire. He smashed 90 from 51 in a second team game against Leicestershire on Tuesday there is every indication that we should expect another fantastic year from him in 2018. Wayne Madsen was a class above during Derbyshire’s visit to Edgbaston in the Championship. His 144 helped his team reach 318 in their first innings and without his contribution Derbyshire would have likely been bowled out for under 200. 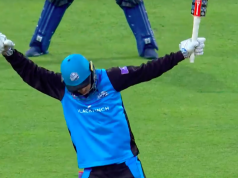 Madsen, a former captain of Derbyshire, also finished as their top scorer during their impressive 2017 T20 campaign with 526 runs at an average of 47.81. The South African born batsmen has blossomed across all formats for a few years now, and another good competition from him will be required if the Falcons are to qualify for the knockout stages. Warwickshire have named a squad of 16, and it’s anybody’s guess who may actually play. Josh Poysden and Alex Thomson are both included alongside Jeetan Patel and there is every possibility that the Bears will pick two spinners if the pitch is conducive to spin. One of either Ian Bell or Jonathan Trott may miss out, such is the quality of batsmen available in this format for Warwickshire. Warwickshire Squad: Jeetan Patel (c), Tim Ambrose (wk), Keith Barker, Ian Bell, Henry Brookes, Sam Hain, Adam Hose, Oliver Hannon-Dalby, Ed Pollock, Josh Poysden, Dom Sibley, Olly Stone, Aaron Thomason, Alex Thomson, Jonathan Trott. New signing Safyaan Sharif could make his Derbyshire debut, the Scotland international has been signed for both white ball formats and will be looking to continue his wonderful form from the ICC World Cup Qualifier. Gary Wilson is available following his involvement in Ireland’s test match against Pakistan. Derbyshire Squad: Billy Godlemen (c), Callum Brodrick, Matt Critchley, Alex Hughes, Wayne Madsen, Duanne Olivier, Ravi Rampaul, Luis Reece, Safyaan Sharif, Ben Slater, Daryn Smit, Hardus Viljoen, Dan Wheeldon, Gary Wilson (wk). The recent good weather looks set to continue on Thursday with no disruption expected. Edgbaston has hosted three Championship games so far, all played on good cricket wickets. There has been plenty on offer for both batsmen and bowler and expect no different here. Previous articleWhy is there such a need for Hameed to succeed?